"Digby Smith 264pp., figs., 10 maps, 6 tables, printed board covers. 2018. 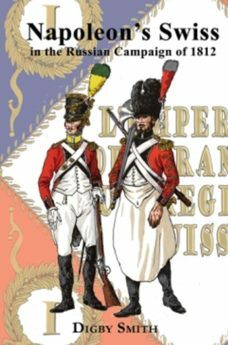 Following Digby’s two volumes on Napoleon’s German Division in the Peninsular War, we are delighted at add this present volume. Digby has thoroughly researched the bi-lingual source material to provide a thorough study of the contribution of the Swiss and in particular their contribution to the Battle of Polotsk."